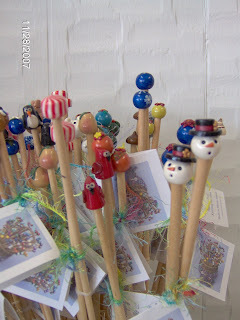 >Perfect Stocking Stuffers & Chance to Win Free Yarn! 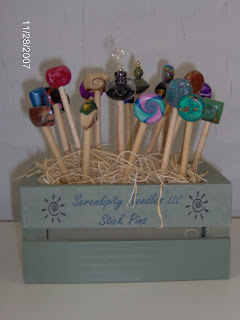 3 Kittens Needle Arts introduces Serendipity Knitting Needles. Each needle is precision sized and handcrafted out of North American White Birch, a slow growing wood which results in a strong and resilient needle. The warm, silky feel of the needles is achieved through an eight step finishing process. Some finials are created from woods and some from polymer clays, each individually hand crafted. We currently have in stock straight 10″ needles with a variety of winter themed finials. Prices for the shawl stick pins are $9 & $11, and the needles are $18, $19 & $20, depending on the needle size. Who can resist a whimsical snowman or a hershey kiss?? 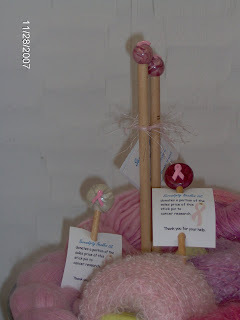 There are also beautiful ‘pink ribbon’ needles & stick pins that make a thoughtful gift and a portion of the purchase is donated to the Susan Komen Breast Cancer Foundation. Add a beautiful pink skein of yarn & a scarf pattern for the knitter, or knit the scarf up and add the stick pin for that perfect touch! These unique products won’t last long – perfect stocking stuffers!! And, I also have a very special announcement from Interweave…. This is a very exciting opportunity from Interweave’s Knitting Daily….Check this out!! Enter the Knitting Daily Yarn Spree at your LYS Contest online and be entered to win up to $300 worth of yarn at our store! Simply visit: http://www.knittingdaily.com/yarn-spree, enter your name and e-mail address, mention that 3 Kittens Needle Arts is your favorite spot to shop, and you could be contacted by Knitting Daily to come pick up a gift certificate for $100-$300 of FREE merchandise this January 2008, just in time to ring in the new year! Visit http://www.knittingdaily.com/yarn-spree and enter to win! Next > >It’s Beginning to Look a Lot Like Christmas!! !